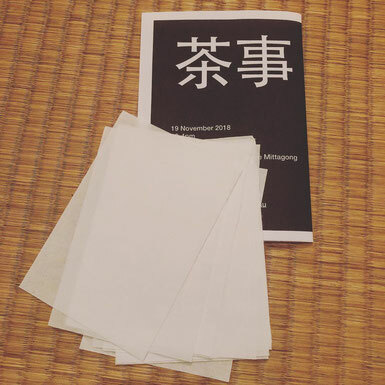 On Monday 19 November 2018, I hosted a chaji to mark the completion of my “karamono” qualification and to thank Adam-sensei for his guidance towards this level of qualification. 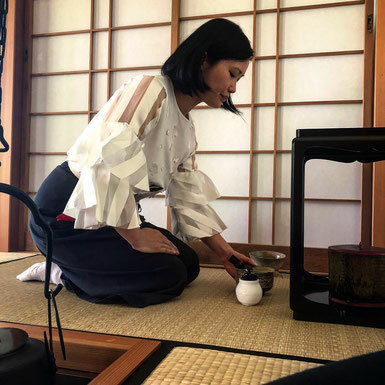 It was my first chaji as a solo host and also the first “official” chaji held at my teahouse at home. Since the completion of the interior of the teahouse - the garden is still a work in progress - in late February, I have been thinking about how I should conduct tea gatherings there that embody my training in the Japanese way of tea in a way that is relevant to the time (the year 2018) and place (Mittagong, Australia). 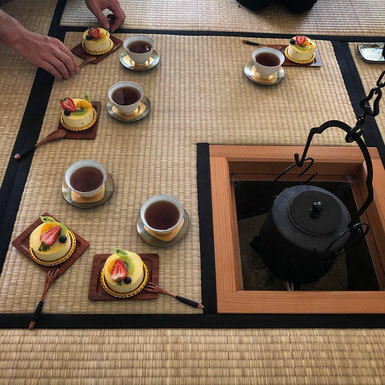 Specifically, the recent focus of my tea practice has been not on recreating Japan in my backyard, but still doing chanoyu in the same spirit as that of the early Japanese and Korean chajin who brought a Chinese Buddhist practice to Japan and who eventually came into their own. 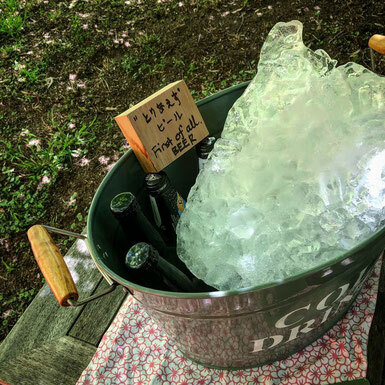 For example, I’m getting comfortable with using locally available ‘binchōtan’ for chanoyu exclusively; and not observing the demarcation between furo and ro seasons - since four seasons in a day seems to be norm here. Instead I’ll make specific decisions based on the level of formality required at each gathering. 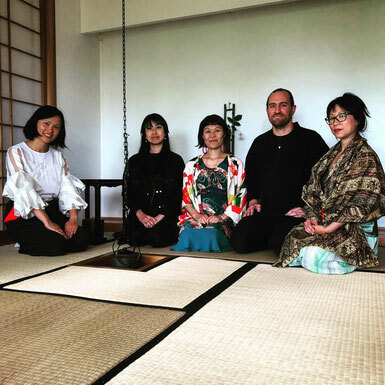 I wanted to present my initial (and still developing) ideas in this inaugural chaji and was thrilled to have Adam sensei as the head guest on this occasion. For the meal, I deviated from the algorithm laid down by “the bible” and took inspiration from Rikyū’s kaiki records, which show that he mostly served simple foods readily available from the household’s kitchen in the form of one soup and two or three side dishes. My teahouse doesn’t have an attached kitchen, so to run on time as a solo host I chose to make three of my go-to summer side dishes that are best enjoyed cold. Other than staples such as rice, miso and sake, all of the ingredients were grown locally or from my garden. 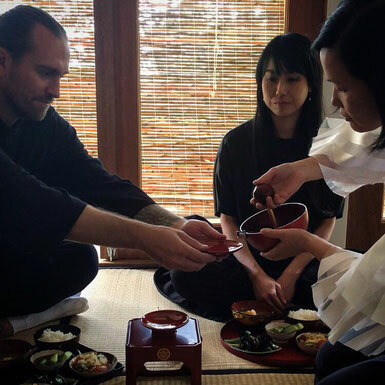 I served everything on a tray for each guest, poured a round of sake and announced my shōban (host's meal in the mizuya). This approach gave me sufficient time to eat a snack (with sake) in the mizuya and then get everything ready for the go-iri. I also introduced an additional course of drinks (purple pu-erh) with the omogashi (main sweet) just before the nakadachi, because whenever I attended a chaji or chaji keiko on the guest side, I was always super thirsty at this point and often had to resort to stealing sips from the tsukubai!! It was well received and I found out that others felt the same, so I’m going to make it a permanent feature from now on. The small amendments I made to the standard programme enabled me to almost run on time as a solo host to five guests, and to devote most of the time to boiling the water and making the tea. I’m glad that the flow I imagined in my head passed the reality test. Adam sensei remarked that the koicha was very good. That makes me happy even if nothing else was achieved 😌. Hosting this chaji was also a rare opportunity for me to find out about the things that I need to tweak and refine further. At the same time, new ideas were popping up as the proceedings unfolded. It has motivated me to keep developing the flow and to implement new ideas. 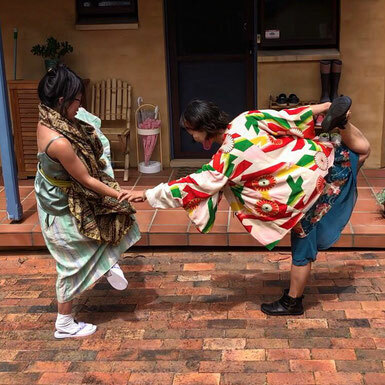 I’m grateful for the visit by Adam-sensei, Erika, Yumi, Pete and Yuka, all coming from afar. I'm also grateful for the page-long feedback from Adam sensei that he wrote on the same night. Adamu Shachū students are very lucky that we have been trained from the start to become capable of conducting solo chajis. In my view, this will make you a chajin.